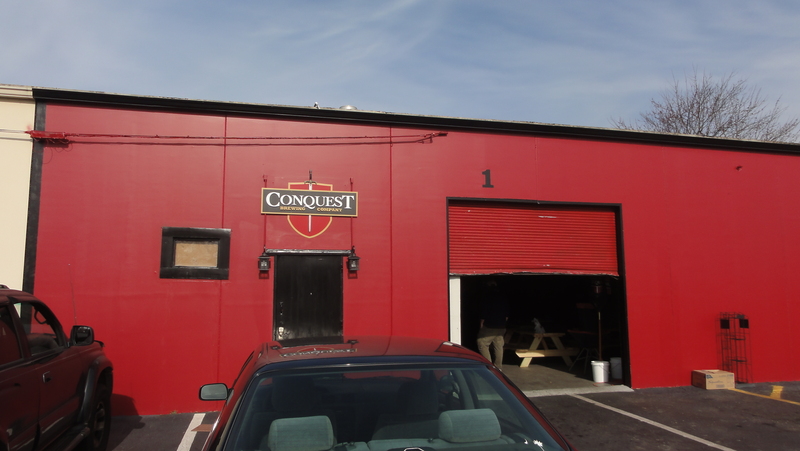 On Friday, 2/7/14, we made our way from Charleston over to Columbia, SC and met with Joseph Ackerman, the President and Head Brewer of Conquest Brewing Company, along with Matt Ellisor, their Vice President and Assistant Brewer. 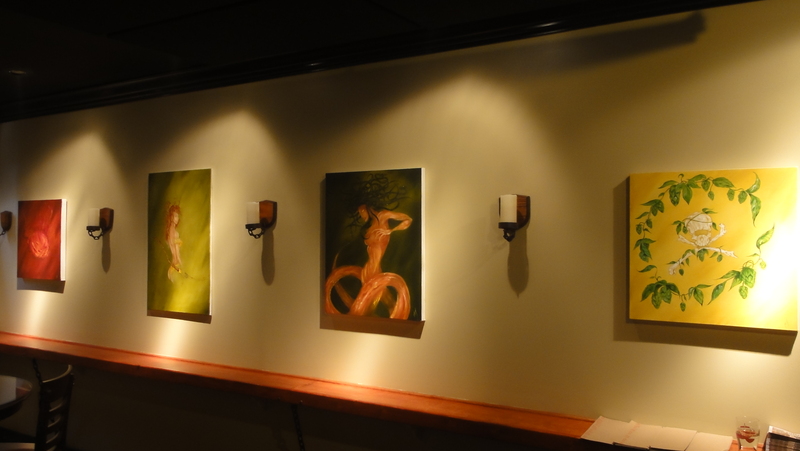 One of the first things we noticed after walking in were the paintings on the walls, which they explained to us had been painted by a local artist named Chuck Maier to represent each of their beers. 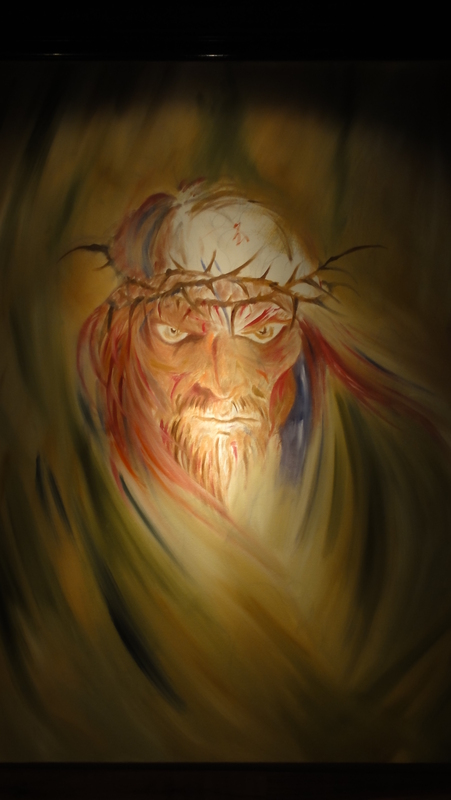 Some of the artwork was created based on the beer names, like Sacred Heart and Medusa Head, while others were painted without knowledge of the beer and then used to represent the beer, like The Finisher. Joseph used to work at Green’s Beverage Warehouse in town, where he helped create a wide selection of craft beer while at the same time getting to know locals who shared his passion. Matt and Joseph had also been homebrewing together for quite a while, which began after they had found instructions to brew beer in a used coffee pot and decided to try it out. That first batch was awful, but they soon learned how to brew very well and their beers were gaining attention around town. After the decision to open up a brewery had been made, they went to the president of the local homebrew club at the time to ask for help. That person, who happened to also conveniently be a lawyer, gave them much needed legal advice. Conquest ended up selling shares in the company to get the money they needed to start up. Usually the number of investors is capped at 10 people, however, in SC that number can be increased to 35, if all of the investors are South Carolinian. 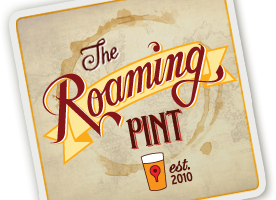 They ended up opening the taproom less than a year ago on June 1, 2013, just days before the Pint Bill passed in South Carolina. Because of that, they were only able to serve samples on their opening day, but are now able to sell pints out of their tasting room. 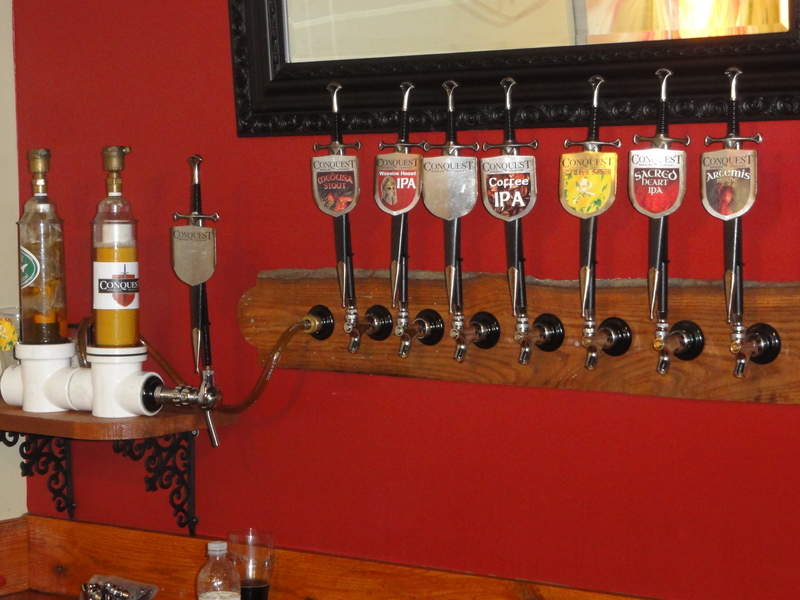 The taproom is full of decorations and furniture made specifically for the brewery, as well as incredibly unique tap handles. To make said tap handles, Conquest purchases real metal daggers and gives them to a local metal worker who uses a laser to punch holes in the daggers and then laser cut small steel shields, in which it etches their logo and then fastens the shield on. 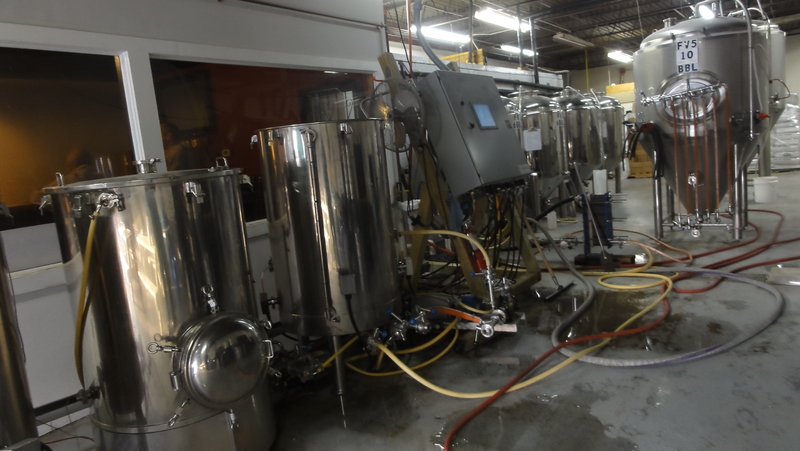 Since the start of their brewing in January of 2013, the brewery has been utilizing a 3 barrel brewhouse alongside four 6 bbl fermenters, and some 7, 10, and 15 bbl fermenters and bright tanks. Outside of the taproom they’re currently found in about 80 accounts around Columbia and, now that they’re able to produce more than they’re selling in just Columbia, they’re looking to expand out into more of South Carolina. 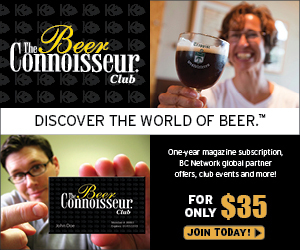 Back on January 25, 2014, Conquest celebrated their first year anniversary with a party that included both an epic bottle share and release of an insane imperial stout called The Finisher that clocks in at 17.5%. 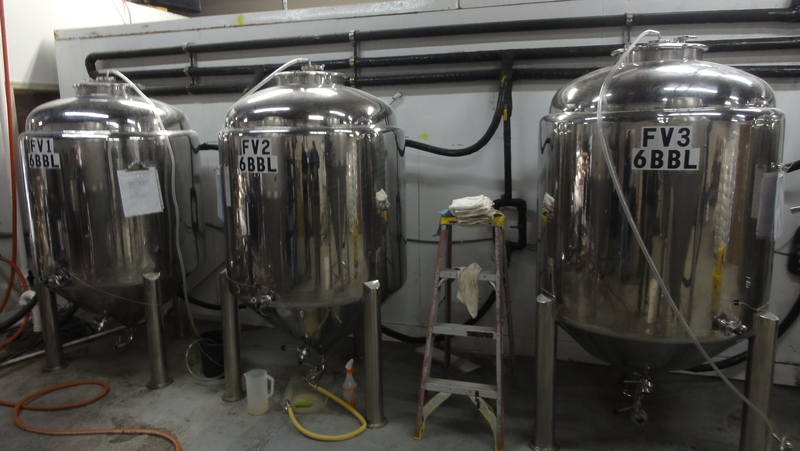 It took them 4 brews on the brewhouse to make about 3bbl of The Finisher, which took around 4 months to finish fermentation. They calculated the grain bill based on the maximum amount that could fit into the mash tun, totaling 350 lbs of grain per batch, and then added 40 lbs of brown sugar and honey in 4 separate stages post-fermentation. After finishing it with a champagne yeast, the final gravity came in at a 1.042. They are preparing to brew that beer again in a few weeks and will be putting it into Jack Daniles barrels to age; as soon as it’s in the barrel, they will brew it again so that they can offer a regular version alongside the barrel-aged version for next year’s one-day anniversary release. Artemis Blonde, Sacred Heart IPA, Medusa Stout, and Warrior Heart IPA are their four year-round offerings, and were all available for us to taste in their taproom while we were there. 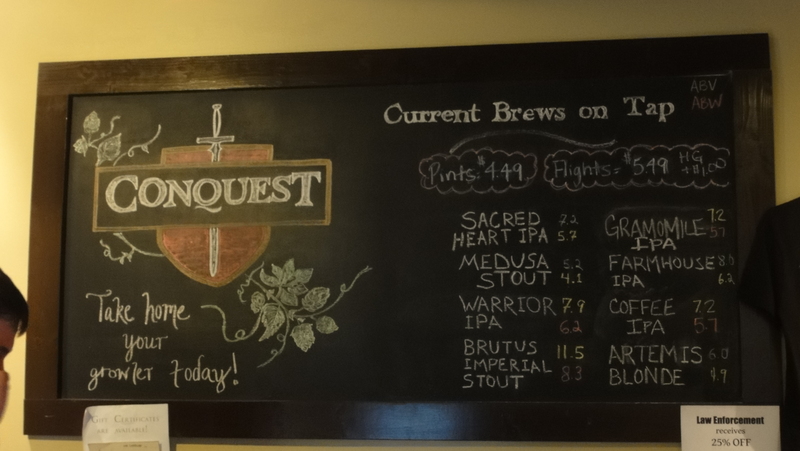 All of those names play into the medieval theme they have, and although the Warrior Heart is available throughout the year, they play around with the hops in every batch; it is always a west coast style IPA, but varies batch to batch. 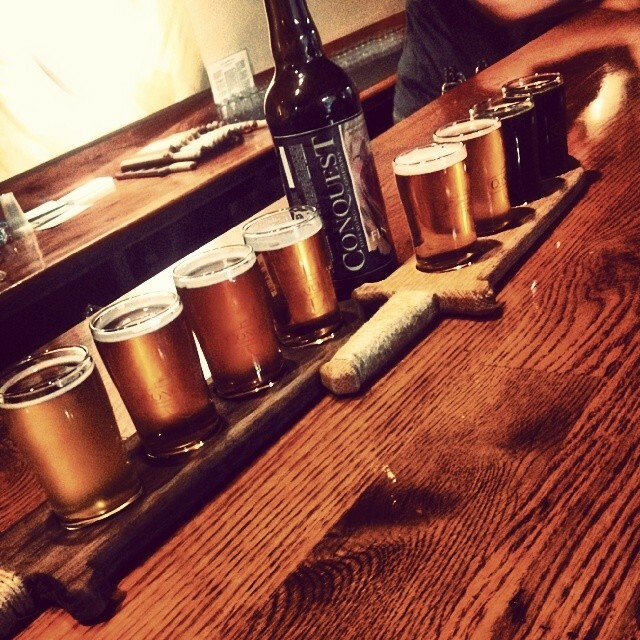 In the taproom they also add variation to those main recipes in different ways. For example, the Sacred Heart was pouring through a Randall with chamomile while we were there, and we were informed that they have used that Randall to add vanilla bean, coffee, cedar, and chipotle pepper flavors to their beers, as well as using jalapeno, cucumber, and thyme together based on a creation from Nick McCormac, a local blogger from Drink. Blog. Repeat. Furthermore, Beach Loveland, who runs Loveland Coffee in town, does a cold brew concentrate that takes around 12 hours to brew, but does not impart any bitterness at all. Conquest treats some of their beers with the concentrate post-fermentation in the bright tank, adding immense coffee flavor without much bitterness. We were lucky enough to try Coffee IPA which used a Guatemalan and Sumatran coffee blend, but were told they have used different blends of the coffee in their other beers as well. They also have more beers to offer, including the Novemberfest Marzen that they purposefully release after October in opposition to the trend of other breweries offering Octoberfest beers too early now; they are also thinking about comically releasing it during the month of March. 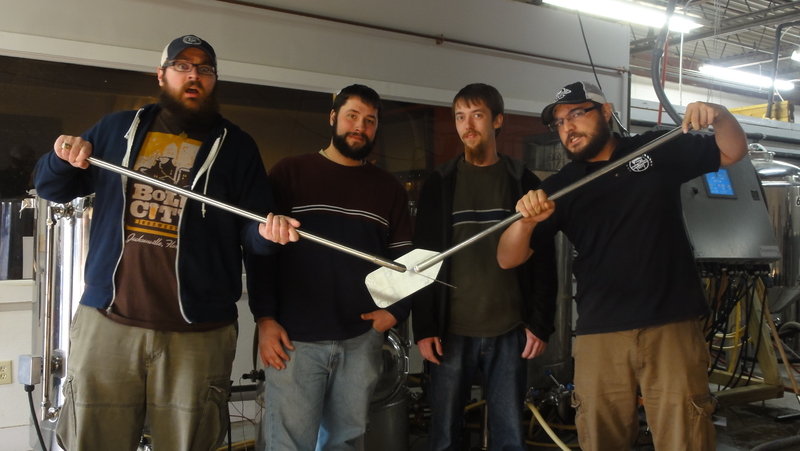 Using a new Southyeast strain that only has a 90% genetic match to any other strain used in brewing right now, they will be serving a new beer on 2/20/14 for the launch of their beers in Greenville, SC, and you will also be able to find that beer at the upcoming Brewvival Festival on 2/22/14. The brewery is located close to the University of South Carolina and the tasting room is open every day except Monday so be sure to make your way over there. They are also open on game days during football season. Big thanks to Joseph, Matt, Jeff the bartender, and the local patron who brought in cake made from The Finisher for hanging out with us!